Capella Pedregal in Cabo San Lucas, Mexico. Ranked #66 in our countdown of the 100 Best Hotels and Resorts in the World. Pass through the torch-lit Dos Maras tunnel to Capella Pedregal and it’s like Narnia. Suites have their own terrace, plunge pool, binoculars for whale-watching and the Sea of Cortez beyond. 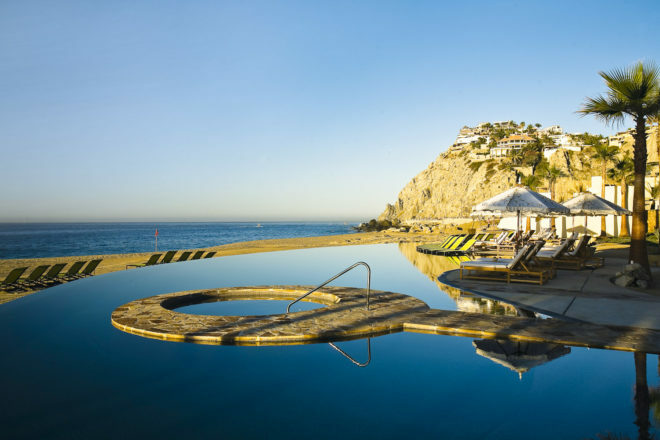 Swim with dolphins, sail, play golf or sip tequila on a sun-drenched lounge. At the Auriga Spa, signature treatments are inspired by the phases of the moon. A seafood dinner with a Baja-slant and frozen margaritas under a thousand flickering lights is magical. Did you know The torch-lit tunnel entrance was the brainchild of the developer’s young grandson.